Chickpeas and grilled chicken breast join some of the farmers' market's best veggies in this super-tasty chicken salad for three. 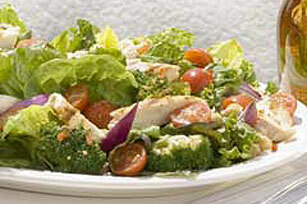 Toss greens with chicken, broccoli, chickpeas, tomatoes and onions in large salad bowl. Cook broccoli in small amount of boiling water 1 to 2 min. or until broccoli turns bright green. Drain. Immediately add broccoli to bowl of ice water; let stand until broccoli is completely cooled. Drain well before using.